When construction workers were on the job in Canary Wharf, London, they found something they didn’t expect. 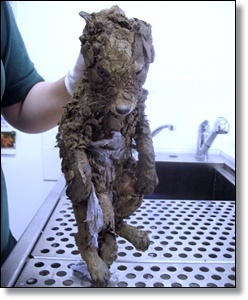 Deep in a hole caked in mud and strips of plastic was a small helpless animal. The workers carefully extracted the animal from the hole, but it was so entrenched in mud and garbage that they could not make out exactly what it was. At first, they guessed it was a puppy, but they soon learned they were wrong. They enlisted the help of a wildlife hospital, and you won’t believe what they found. The workers contacted specialists from the Essex Wildlife Hospital who worked for hours to carefully clean the animal. 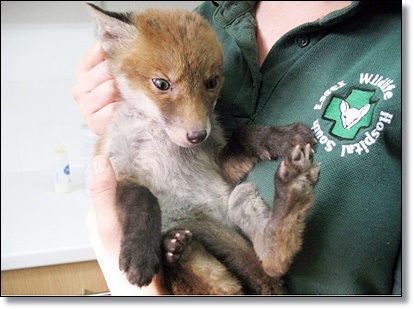 After a good bath and lot of special care, the workers were able to properly identify the animal as a four month old baby fox. They named him Muddsey and lauded the construction crew for saving him.